Plan and plant my garden. I will probably do my starters this weekend. So far I've planned for parsley, cilantro, snap beans, summer squash and maybe tomatoes. I'm still not sure about tomatoes because they are intimidating to me! Plant flowers in the front flower beds. Last year I bought a few tiny impatiens and they took off! I loved them so much that I want to buy more and line the entire front flowerbed with them. They grow quickly and love the afternoon sun on that side of the house. Repaint the kitchen cabinets. We painted them white a little over a year ago, but we used the wrong paint. So now, we want to go back over the cabinets with another white paint and reseal them. This is more in preparation for selling our house next year than because it looks bad. Replace the sliding glass door. This thing is the bane of my existence. It sticks all the time and I have to pull with all of my strength to open or close it. I've broken way too many nails on this dang door and I can't wait to be done with it! Put out my anniversary wreath. More on that here. Plan a fun anniversary outing. Our 3 year anniversary is April 12 so I want to plan something fun for us to do. What about you? 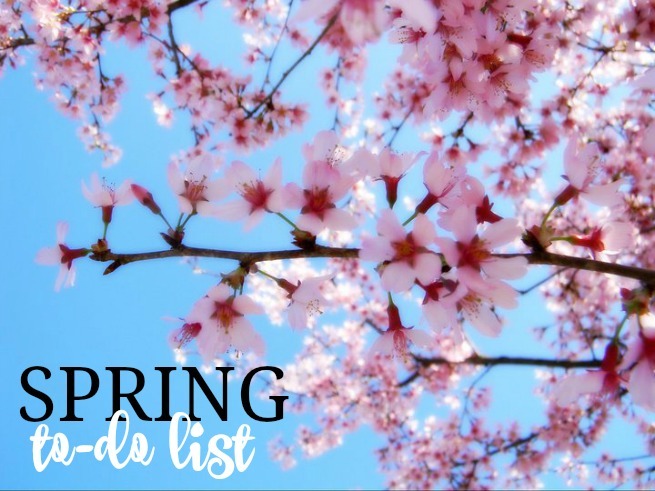 Do you have a to-do list or goals for this spring? I feel like my spring to do list is too long. We have let our backyard get beyond overgrown and with all this rain out here in California you can imagine what kind of overgrown i'm talking about. I did a deep clean of my house this past weekend and it felt amazing...until the dog came in with wet dirty paws! Arghh. I do not not not feel like doing my front flower bed this year.